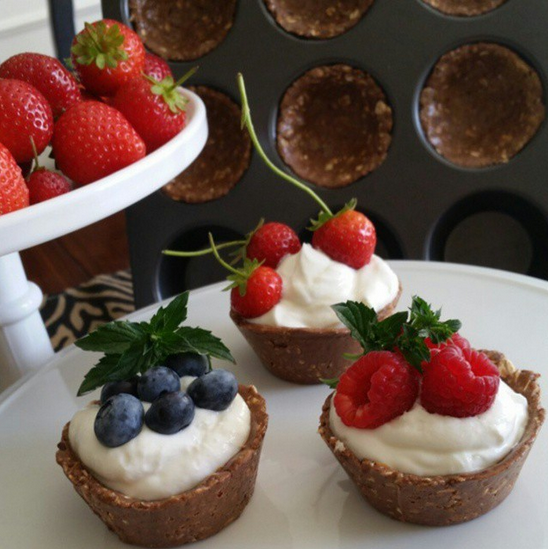 Little Berry Cups packed with Protein & Cuteness. 1 1/4 cups all natural almond butter/all natural Peanut Butter, or favorite Nut butter substitute. Use your hands to combine oat mixture very well. Place 2 Tbsp of the raw oat mixture into each spot in a regular size muffin tin. Press smooth around the sides. Form a cup with your fingers. Make a nice spot to hold your goodies. Place muffin tin in the freezer for 2 hours or overnight (if overnight cover with plastic wrap before freezing). To easily remove cups from muffin tin, run the bottom of the tin under warm water for just a few seconds. They will pop right out, when gently lifted with a knife. Fill with greek yogurt, or whipped coconut cream, and berries. Serve immediately, or store in the FREEZER until ready to serve. You can keep a weeks worth in the freezer (covered well with plastic wrap) to serve in the mornings!